MAJESTY AND MENU meet with fabulous, easy-to prepare recipes—fit for the king. Renee Chernin, recipe developer and creator of the popular TheKosherChannel.com, was a freestyle cook, experimenting with techniques, never making the same thing twice. When she started her own catering business, she began to write down her recipes, testing and tweaking until each dish was perfectly balanced and easy to reproduce. Passionate as she was about cooking, Renee also realized that it’s not just about great-tasting food. Food plays a crucial role in Jewish life—for nurturing our families and feeding our souls. Tishrei is a spiritually charged month. It’s also a lot of work: planning, shopping, cooking, serving, and cleaning up. It can be overwhelming. In Cooking for the King, Renee makes yom tov preparation doable with easy-to-prepare, custom-tailored-for-the-day dishes you won’t be able to resist. Accompanied by stunning full-color photographs, every recipe comes with prepare-ahead instructions, and every entree includes menu suggestions. Yom tov cooking has never been simpler to plan. Now you can enjoy yom tov the way it was meant to be: fit for the King. From the Mango-granate Barbecued Fish and Snappy Slaw to the delectable Beets Everything Chocolate Cake with Chocolate Buttercream, you won’t believe how easy it is to make great-tasting holiday fare. The Oven-Baked Glazed Corned Beef provides a simple twist on a yom tov favorite, and the Texas Caviar infuses the menu with a Down South flavor, a tribute to Renee’s Southern background. The Harvest Bisque will become your fall go-to dish, and you’ll enjoy the tailored-for-Rosh-HaShanah Chicken Rimon and Shanah Tovah Salad. Once you’ve tasted these dishes—you won’t want to make yom tov without them. ONE OF THE basic premises in Judaism is that we don’t negate the physical dimension of our existence. On the contrary, the Torah is replete with God-mandated commandments that for the most part can be observed only through a physical medium. Curiously, the Almighty, who wants us to reach for spiritual goals, has seen fit to place us in a world of blandishments and temptations where we might easily lose sight of the ultimate purpose of our lives. The implicit challenge is to maintain balance, to enjoy the beauty and bounty that God has provided for us, using His blessings wisely in the service of His will. Clearly, eating is one of the great physical pleasures in life. One can engage in it in its most basic form, simply indulging at will—or use it to build a bridge between heaven and earth. Renee Chernin, in her book Cooking for the King, has proven to be an expert at building this bridge. I know Renee personally, and she is a consummately spiritual individual. She is also a great cook. Renee’s recipes have been tried and tested, and her Torah insights have the capacity to transform food preparation from a mundane activity to the service of the heart and soul. Indeed, in using this book, one will find that there need not be contradiction or conflict, that culinary delights, so clearly physical, can also be supremely spiritual—truly heavenly delights. FOOD IS SO much more than it is cooked up to be. From man’s first moment of existence, the relationship between him and his Creator has been expressed through diet (“from all trees of the garden you shall eat; only from the tree of knowledge of good and evil you shall not eat”). By creating man as a creature dependent on food, he has been given frequent opportunities to remember his Creator and know Him as his benevolent Provider. It is for this reason that so much of Jewish life takes place around the dining room table. What would Shabbos be were it not for the Shabbos table? Would yom tov have its impact if it were not celebrated over an elegant, stately dinner in honor of the special day? Indeed, it can safely be said that Judaism’s most precious mesorah—that which is passed from parent to child—takes place primarily in close proximity to food. And it is around food that the essence of our people emerges. We see the physical pleasures of this world as gifts from God, designed to be used to discover Him and perform His service. We look to release holiness into the world not through asceticism, but through the dedication of the physical universe for its original purpose—to know our Creator. And by properly structuring our relationship to physical pleasure, we discover yiras Shamayim, the fear of Heaven, and develop character traits that bring us to the highest level of human refinement, and of intimacy with God. Cooking for the King is based on the principle that there is nothing mundane in a world created by God: “All that I created was designed for My glory.” God is found, and served, in the kitchen as well as in the beis midrash. Mrs. Renee Chernin models the essence of this book in her life. In her home is found the crossroads of elegance, hospitality, and sanctity. This book is not the result of her work, but rather of her being. Now the public has the opportunity to benefit from what is clearly an expression of her soul. Through these pages, the homemaker, the chef, the hostess, will be transformed into servants of the Divine, constantly reminded that through her creations she is blazing a trail that leads to the source of all creativity, the true pleasure hiding in food. I invite you to join our author in unveiling that secret in your own kitchen. This year that conversation is going to be different. Enter Cooking for the King, a new cookbook that takes care of the gashmiyus—while nourishing the ruchniyus. 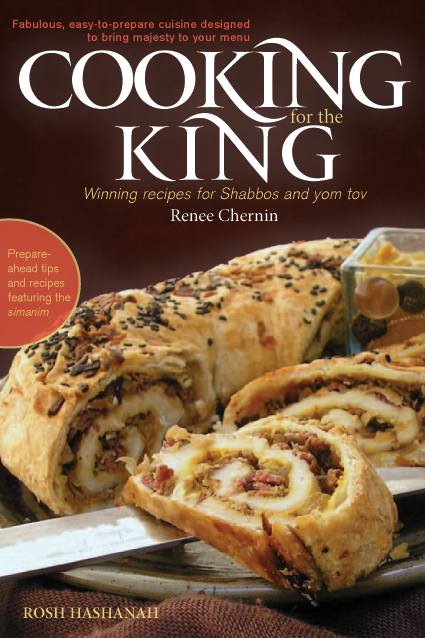 Cooking for the King by Renee Chernin is more than a cookbook. It’s a guidebook to Rosh HaShanah, and indeed to domestic life throughout the year, from the grocery store to the kitchen to the table—and everywhere in between. Chernin’s book so aptly demonstrates that one can eat to indulge or one can use food “to build a bridge between heaven and earth.” Cooking for the King builds a bridge between recipes for food and recipes for life. This year, Rosh HaShanah preparations will be different. Cooking for the King is a siman of that! RENEE CHERNIN has contributed to the Baltimore Jewish Times, OU.org, Horizons Magazine, Jewish Action, Aish.com, and the Deep South Jewish Voice. Thousands visit her website, TheKosherChannel.com, each month. She made aliyah with her husband, David, in 2007 from Atlanta, Georgia, and now lives in the Old City of Jerusalem. A VARIED COMBINATION of ingredients, all easy to find, that complement each other to produce an amazing fresh flavor that even non–fish lovers will enjoy. Cilantro is delicious with mango, but if you prefer, top fillets with sliced scallions or fresh parsley for a punch of color. 1. Pat the fish fillets dry with paper towels. In a non-metallic container, brush the barbecue sauce lightly over the fillets and let sit at room temperature for 30 minutes. 2. In a medium saucepan, heat 1 tablespoon of the oil over medium heat. Add the onion and cook until soft, about 5 minutes. 3. Add the mango, pomegranate juice, salt, onion powder, garlic powder, and cayenne pepper and stir well. Simmer, uncovered, for 10 minutes. Remove from the heat and puree until smooth. 4. In a large skillet, heat the remaining 2 tablespoons of oil over medium heat. Brown the fish until almost cooked through, about 2–3 minutes per side, depending on the fillets’ thickness. 5. Pour the mango sauce over the fish and simmer until the fish flakes easily with a fork, an additional 3 minutes. Garnish with the cilantro, scallions, or parsley. Salmon Quiche will keep in the refrigerator for up to 2 days. WHETHER IT IS a matter of location or one of convenience, purchasing fresh fish is often not an easy option. I am regularly asked, “Is fresh always best?” Maybe, maybe not. Unless you caught the fish yourself, you really have no way of knowing exactly how fresh it is. Smell it: fresh fish should smell fresh, like cucumbers. See it: the flesh color should be vibrant, the skin shiny and metallic. Any liquid from fresh fish should e clear and not milky. Purchase only vacuum-packed fish or fish labeled “flash” or “quick” frozen. This means they were frozen within hours of the catch. The best varieties to buy frozen are salmon, tilapia, halibut, and flounder. Thaw fish slowly in the refrigerator. Thawing under water or in the microwave diminishes the flavor and texture of the fish. After thawing, drain, rinse, and pat fish dry before preparing.